Google Chrome has finally been released in beta for Mac users, more than a year after the browser was released for PC users. 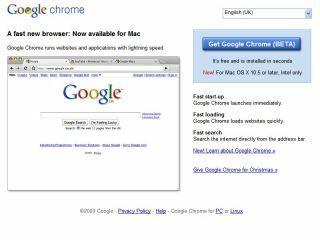 Chrome is now available to those with Macs running Mac OS X 10.5 or higher and an Intel processor, but don't expect complete functionality as the release is still beta-based. So what does the beta block(er)? Well, you won't be able to use apps like GMail (because Gears is not supported) although but you will be able to take advantage of the speed and stability of the browser – something Google is more than pleased about, and the fact you can search straight from the browser. When you do download the beta, you have the choice of importing all your Safari bookmarks or your Firefox ones, depending on what your browser of choice is at the moment. To download the Mac version of Chrome, point your browser to google.co.uk/chrome and choose the Mac option.